A couple videos from this past week involving current and former Thunder players at the Team USA Minicamp held in Las Vegas, NV. Enjoy! Seven games in and the Oklahoma City Thunder are still looking for that statement victory. They beat the Knicks, Pacers, and Bulls pretty handily, like they were supposed to. And for as good as Giannis Antetokounmpo has been, the Bucks are still an inconsistent, middle of the conference team in the East. The three games against sturdier competition have resulted in losses. Middle of the week. Let’s push through. Here are the rumblings for this Wednesday. Russell Westbrook is organizing workouts in Los Angeles for his teammates. The first real test of the Oklahoma City Thunder’s new season. 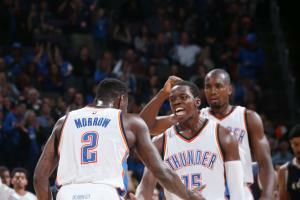 The Thunder have quietly won 5 of their last 6 games and seem to be hitting their stride. Russell Westbrook has been MVP-worthy in the games that he has played. Kevin Durant appears to be getting back into game shape. And the Thunder, as a whole, are getting used to playing as a full collective. In the last game, against the Milwaukee Bucks, Oklahoma City trotted out multiple small ball lineups to combat what Milwaukee was doing. And they worked for the most part. As much as the young Thunder have grown in that trying first month, Scott Brooks appears to have grown as much. Brooks is like a kid in a candy store with all the line-up possibilities. Once known for his stubbornness in adapting to the opponent’s personnel, Brooks now appears confident enough in his rotation to trot out various line-ups to combat whatever the opponent is throwing out there. 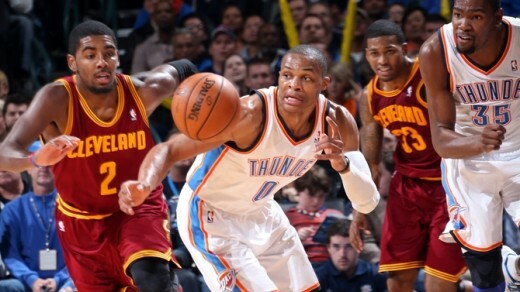 This is the first meeting of the season between the Thunder and the Cleveland Cavaliers. They split their two meetings last season, but these are not your 1 year old son’s Cleveland Cavaliers. Past history will likely have little bearing on these future meetings. The Cavaliers come into tonight’s game with a 13-7 record, riding an 8-game win streak. After a rough start that saw them start the season 5-7, the Cavs seem to have finally righted the ship. LeBron James is once again LeBroning (no, not that LeBroning), and the other “big 2”, Kevin Love and Kyrie Irving, are getting used to their new roles. The Cavs are top-1o in most major categories except for defensive rating (14th – 106.1) and rebounding (24th – 41.2 per game). Leading the charge is 4th year point guard Kyrie Irving, who has slowly adjusted to his new role as a facilitator/attacker from just solely being an attacker. Irving’s ability to pick and choose the right spots where he is needed to take over has been a big factor in the Cavs’ recent resurgence. On the wing, LeBron James has recovered from his early season swoon, and is back to being his MVP-caliber self, averaging 24.8 points, 5.5 rebounds, and 7.7 assists per game. On the other wing, Cavs coach Dave Blatt inserted veteran SF Shawn Marion into the starting line-up early in the season to help provide some perimeter defense. Up front, Kevin Love has probably had to make the biggest adjustment of the the 3 All-Stars. To go from alpha male to 3rd option can be a difficult change. But Love has done his best Chris Bosh impersonation and is learning how to make the most of his opportunities when they are presented. The veteran Anderson Varejao mans the middle providing his usual energy and defensive presence. Off the bench, Dion Waiter, Tristan Thompson, and Matthew Dellavedova will get most of the reserve minutes. 1. 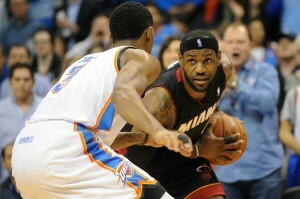 LeBron James vs. Andre Roberson/Perry Jones – Yes, Kevin Durant will guard James at times. But a lot of the success of the Thunder will be dependent on Durant being on the floor and not getting into foul trouble. This is where Roberson and Jones come into play. Jones’ career, before his 3-game scoring binge at the beginning of this season, has been defined by the job he did on James in the 2nd half of the Thunder game against the Heat in Miami last season. While he didn’t necessarily shut him down, he did make James work for whatever he got in that game. And most importantly, he kept Durant off of James. 2. Serge Ibaka vs. Kevin Love – Love has always been a match-up nightmare for Ibaka. Love can grab rebounds with the best of them, but can also take you outside on the perimeter. That inside/outside game can cause Ibaka to get lost in the shuffle. Look for the Thunder to play smaller, and for Ibaka to be more on Thompson or Varejao than Love. 3. Russell Westbrook vs. Kyrie Irving – Whoever plays the smarter game will likely lead their team to victory. But one of these two, if not both, will likely look to one up the other at some point in the game. 1. 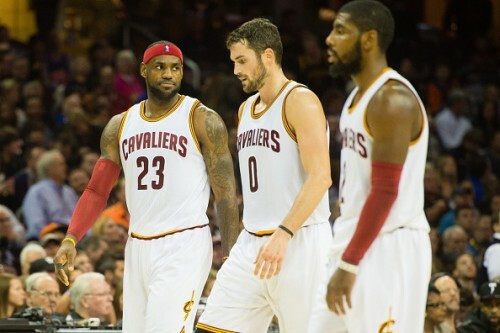 Rebounding – A lot like LeBron’s Miami teams, rebounding is a weakness of this Cavalier team. Even with Kevin Love, who is averaging his lowest rebounds per game average since his rookie season, the Cavs still struggle on the boards. On the offensive end, Love finds himself on the perimeter many times, negating offensive rebounding opportunities. Defensively, Cleveland’s penchant for forcing teams to shoot jumpers, causes long rebound opportunities to land in the lap of the offense. The Thunder will definitely need more than 1 rebound in a half from Steven Adams in this game. 2. Bench – The Thunder’s bench unit is becoming one of the better ones in the league. The Cavs bench is one that can be extremely streaky, especially Waiters. As long as Reggie Jackson, Jeremy Lamb, and Anthony Morrow play their games, the Thunder bench should be a net positive against the Cavs. 3. Mike Miller – I don’t care if Miller has missed the last 3 games with a concussion. He should be available for this game, and he torches Oklahoma City nearly every time he plays against us. I fully expect him to go 4/5 on 3-point shots.